"When Lakefield Farm offered "The Wonderful World of Horses", a course taught by Rosanne Korinek, my childhood dream re-emerged." Two years later I am the proud owner of an amazing horse, Snowman. When I walked onto the farm to attend my 1st class, I felt like I was "home." Rosanne and Don have created a culture at Lakefield where everyone feels welcome. As someone who had no real knowledge or understanding of horses, just childhood memories of a few wonderful trail rides, I came to Lakefield hungry to learn. Whether it's lessons, winter workshop/discussion groups, indoor or outdoor clinics, I've signed up for it all. When you spend time at the farm, the Korinek's passion for horses and creating the best environment for everyone becomes your passion too. As a family they have over 100 years of horsemanship experience, yet their culture is one of inclusion, commitment to continual learning and openness to new ideas. What strikes you immediately as you spend time at the farm, is everyone's willingness to help each other. Whether you are young or old, ride western, english, compete or just want to enjoy a trail ride, everyone is equal and treated with respect. Our first priority is what is best for the horses. My journey went from that 1st course, to private lessons on school horses, to leasing a horse Rosanne matched for me, and then buying that horse 1 year later. Rosanne and Don have helped me every step of the way, beginning with lessons. Then, whether it was buying my saddle, to understanding what veterinary care I should anticipate, I couldn't have done it without them. The fact that so many borders have been there for many years is no accident. As the gift of retirement has become my reality, the joy of horsemanship and being at Lakefield Farms is where I know I belong. It's never too late to reach out in life for what ruly makes your heart sing! I first met Max about 13 years ago, when my daughter, Devon, leased him at Appleridge Barn. He was the horse of her best friend, Erin, who had gotten a new horse but did not want to sell Max. He was a great teacher for Devon, and we both fell in love with his gentle spirit; I found that I was particularly attached to this beautiful horse. A few years later, Erin passed away suddenly and tragically at the age of 19. About a year after her passing, when it was apparent Devon needed more of a challenging equine teacher, Max was re-homed to a barn in Richfield. In the last 10 years or so, I frequently found myself thinking of – and missing – Max. I had reached out to Erin’s mother, Jan, a few times to inquire about his wellbeing, and we both felt that he had found a good home at his new barn. Although I visited him from time to time, it did not make me miss him less. This past summer I happened to run into Max’s owner at a clothing resale shop in Thiensville. I mustered up my courage, and inquired whether she would ever consider letting Max go. To my surprise and pleasure, she agreed. After some planning, Max was returned to me on September 29, 2017 – what would have been Erin’s 30h birthday. It is our belief that this transition would have pleased Erin immensely. Although he is an old guy – 28 or 29 – and in need of some medical and dental attention, he is the light of my life (okay – after my children – but he’s up there)! He has adapted well to his new home, and was quickly embraced by all the humans at Lakefield (his pasture mates took a bit longer, but that’s okay). Both my daughter and Jan also spend time with him, and it feels right to have him home where he belongs. 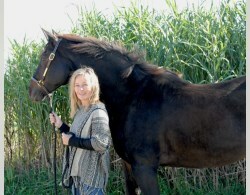 So, at the age of 60, I finally have the horse I’ve wanted since I was a young girl. Moral: It’s never too late to reach out in life for what truly makes your heart sing! "Lakefield Farm is much more than just a place to board a horse." It is the place where a journey began a long time ago for a little girl who wanted to learn to ride horses. Since then it has progressed into a family pastime, an education in horses and ourselves, and a wonderful adventure. None of this would have happened without the knowledge and dedication of Lakefield Farm and the Korinek family. Eleven years ago my daughter wanted to take riding lessons. She started taking lessons at Lakefield when she was 5 years old, first with Paula and then Leanne. Over the years she has learned to ride well, had a lot of fun, success and failures at horse shows. Most importantly she developed the knowledge of horses and horsemanship and confidence in herself both as a rider and individual. 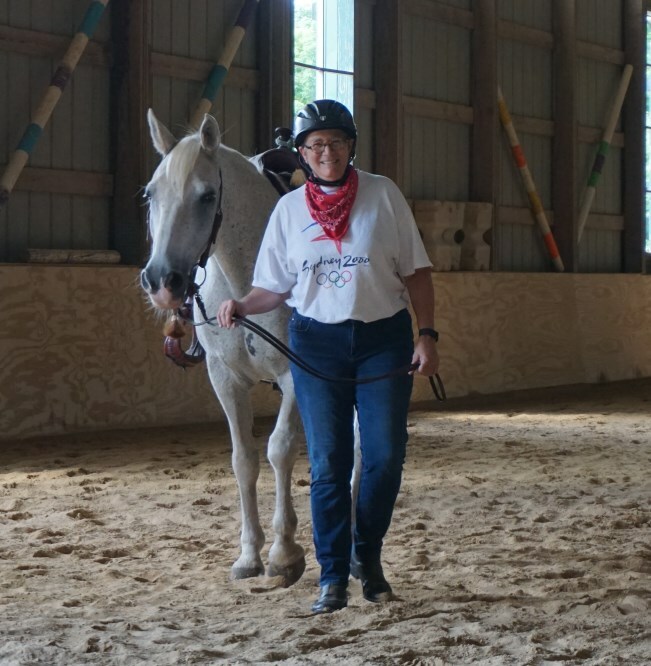 She has been given many opportunities at Lakefield….horses to ride when we didn’t own a horse, helping with lessons, volunteering at summer camp, working with therapeutic riding, feeding at the barn and much more. Lakefield Farm has been a fantastic place for a girl to grow up. We were very excited when the time finally came to purchase a horse 3 years ago. We could not have done this without Leanne’s help. She helped us look online; she went with us to look at every horse. She drove us out to pick him up when we finally found our horse and brought him to his new home. And yes, it is home. Everyone was so excited for us. Never having owned a horse before we sure had a lot to learn. We were so lucky to have so much knowledge available to us. Don, Rosanne, and Leanne all bring something different to the table and yet with a common thread. They are extremely kind and patient teachers. I have learned something different and valuable from each of them. They are incredible resources and I could not have begun this journey without them. 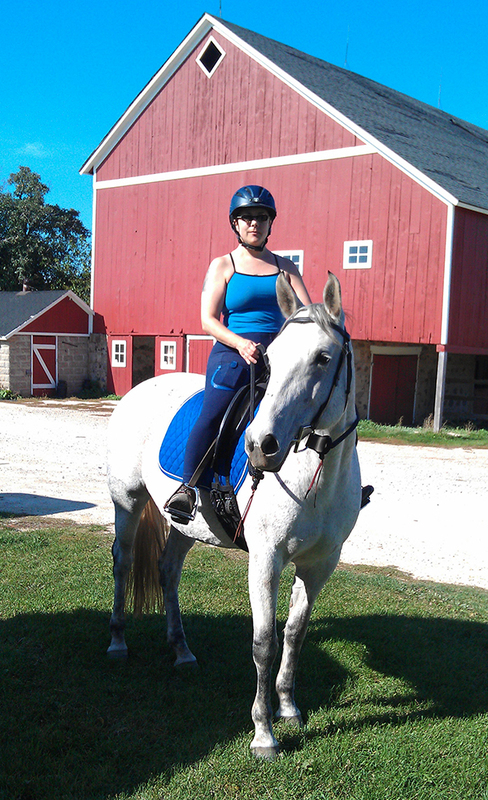 I just yesterday took my horse out to the Kettle Moraine area for a fall ride and had the best ride of my life. Throughout the entire ride I could hear each of their voices telling me what to do and what not to do and it all came together for the best ride ever! I would never have guessed at what an important part of my life and my children’s life Lakefield Farm would become when we started this ride 11 years ago. It truly is like a family. The support, encouragement and kindnesses shown are incredible. Everyone at the barn is part of the family. Everyone shares in each other’s successes and failures. We have a lot of FUN!! It is not just a place to keep your horse. It is a home. "Without their help, we would not have this type of relationship with our horses"
My husband and I had the opportunity to be part of Lakefield Farm for 15 years. During our time at the barn we took lessons, boarded our horses and worked for the Korineks. Recently we moved out of state with our horses. In the few short months we have been at the new stable, the statement we hear over and over again is that our horses are so well behaved. Farriers, barn staff and trainers all rave about our horses’ manners and personalities. The reason they are so well behaved and loved is due to the Korineks sharing their knowledge and horse handling expertise with us. They taught us how to get our horses to respect us and trust us without fearing us. They showed us how to be consistent and patient in order to form a bond with our horses. Without their help, we would not have this type of relationship with our horses. We are forever indebted to Don and Rosanne for showing us how special the bond between horses and humans can be. "Lakefield is a great place to learn and grow as a rider and a horsewoman." They have the skills to teach you any discipline and offer important insights into the nature of horses and horsemanship. I continue to gain valuable skills under their tutelage. With trails, indoor and outdoor arenas to ride, you won't get bored. They have clinicians come in offering even more opportunities to learn. I bought my own horse after taking lessons at Lakefield for 4 years. I finally felt confident enough to take that step and Espirita and I have learned so much from the Korineks. I feel confident that when I am not there she is well taken care of. I have learned that like any true art, horsemanship is a journey. I am glad I'm on that journey with the Korineks and Lakefield Farm. Two Senior Citizens plus a Yearling Thoroughbred equals . . .
"Disaster" would be a possible answer. Throw in the fact that the couple had never owned a horse before and "disaster" would be the probable answer Fast forward two years and the horse, Whinny, and the couple are still alive and kicking and enjoying the education process. Whinny, is a sweet, smart and forgiving horse and I have and am still acquiring horsemanship skills thanks to the help of many people. My story starts when I was diagnosed with a cancer in 2007 that is not easily curable. In 2008, my husband gifted me with a trip to the Kentucky Bluegrass knowing that I had always been "horse crazy." It was an active trip offering real insight into the racing industry. A small breeder invited us to her farm where a 3 week old foal came up and licked me on the face. I was smitten and with my husband's encouragement, purchased a "leg" (25%) of the filly with the idea that I would follow her progress in racing. That was May, 2008 and I took several trips to visit her in Kentucky during the year. By 2009, the economy and the racing industry had taken a big downturn. Before Whinny was scheduled for sale in the Keeneland yearling auction, I purchased her remaining 3 legs as I was unsure what would happen to her. Bob and I visited several farms in the S.E. Wisconsin area and we selected Lakefield Farm to board Whinny. 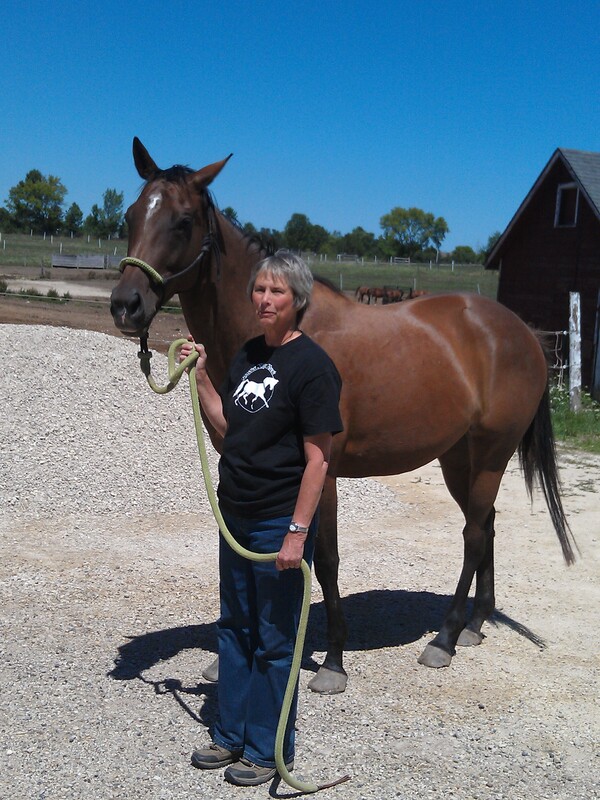 The owners, Don and Rosanne Korinek, drove to Kentucky and trailered Whinny to Wisconsin. They and their daughter, Leanne, have been our trainers, sources of information and equipment and our first line of equine health care. The other boarders have shared their expertise and provided their support and the contents of their lockers. For me, Whinny has been my best medicine, giving me a focus beyond myself, exercise and an introduction the nice world of horse people.